Product prices and availability are accurate as of 2019-04-02 11:59:34 EDT and are subject to change. Any price and availability information displayed on http://www.amazon.com/ at the time of purchase will apply to the purchase of this product. 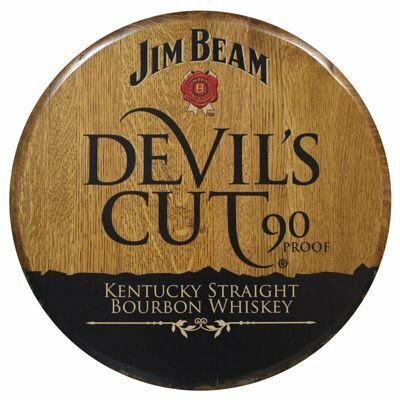 For your favorite bourbon lover this unique bourbon barrel head with a Devil's Cut logo design imprinted on top makes a distinctive addition to any room, office, or bar area. Constructed from an actual used and repurposed bourbon barrels, this white oak barrel head has been mounted to a support panel with keyhole slots for hanging. The barrel char has been retained for authenticity and this high resolution direct print image is ready to hang. While each barrel head is slightly different due to its handmade construction, the barrel heads generally run 21" across and 1½" thick. Please allow 7-10 business days for the production of this unique piece. About the bourbon: As bourbon ages, a portion of the liquid is lost from the barrel due to evaporation - that's the "Angel's Share." After aging, when the bourbon is dumped out of the barrel, a certain amount of whiskey is left trapped within the wood of every barrel. 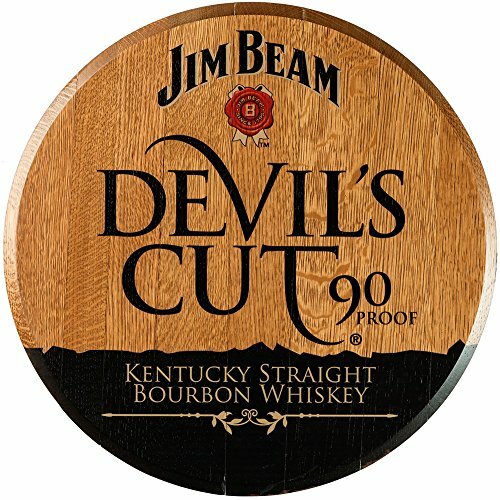 Jim Beam calls that the "Devil's Cut." To create Jim Beam Devil's Cut, the distillers at Jim Beam developed a proprietary process that pulls out the rich whiskey trapped inside the barrels' wood after they're emptied. They hold this barrel-treated extract until it develops the proper balance of bourbon notes, then blend it with 6 year old bourbon and bottle at 90 proof. The result: a robust, premium bourbon with deep color, aroma and character.